New York — New construction starts in October climbed 21 percent to a seasonally adjusted annual rate of $864.0 billion, according to Dodge Data & Analytics. The substantial increase followed three straight months of decline, during which the pace of total construction starts fell 22 percent from the exceptionally strong volume reported back in June. 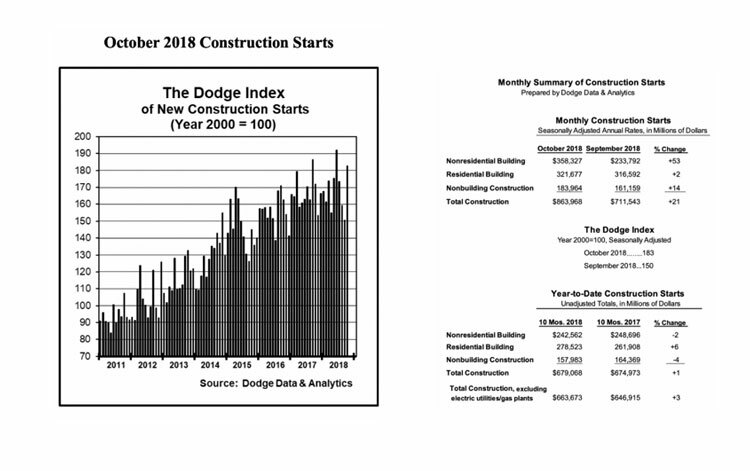 Nonresidential building in October surged 53 percent, as several very large projects lifted the manufacturing plant, office building, and transportation terminal categories. Nonbuilding construction in October advanced 14 percent, supported by growth for public works while the electric utility/gas plant category bounced back from depressed activity in September. Residential building in October edged up a slight 2 percent, helped by improvement for multifamily housing. During the first 10 months of 2018, total construction starts on an unadjusted basis were $679.1 billion, up 1 percent from the same period a year ago. The year-to-date gain for total construction starts was restrained by a 45 percent slide for the electric utility/gas plant category. If the electric utility/gas plant category is excluded, total construction starts during the first 10 months of 2018 would be up 3 percent relative to the same period a year ago. October’s data raised the Dodge Index to 183 (2000=100), up from September’s 150, marking the second highest reading for the Dodge Index so far in 2018 after June’s 192. Through the first 10 months of 2018, the Dodge Index averaged 169, up slightly from the full year 2017 average of 166. Nonresidential building in October was $358.3 billion (annual rate), up 53 percent from September’s lackluster amount. After registering heightened activity in June, led by the start of a $6.5 billion uranium processing plant in Oak Ridge ,Tenn., and the $1.8 billion Spiral office tower in New York, nonresidential building retreated for three consecutive months before October’s upturn. Manufacturing plant construction in October jumped 189 percent, boosted by the start of a $2.4 billion propylene oxide and tertiary butyl alcohol plant in Channelview, Texas, and a $1.6 billion natural gas processing plant in Douglas, Wyo. Additional manufacturing plant projects included as October starts were a $400 million wood products plant in Lexington, N..C, a $400 million natural gas processing plant in Watford City, N.D., and a $320 million biofuel refinery in Lakeview, Ore. The commercial building structure types as a group increased 48 percent in October, strengthening after declines during the previous three months. New office construction starts in October climbed 123 percent, led by a $750 million Facebook data center in Eagle Mountain, Utah. There were eight additional office projects valued at $100 million or more that reached groundbreaking in October, including the $644 million office portion of the $1.3 billion Winthrop Square Tower in Boston, the $475 million office portion of the $600 million Marriott headquarters and hotel in Bethesda, Md., and the $267 million office portion of a $1.0 billion mixed-use development in Detroit at the site of the former Hudson’s department store. Hotel construction in October advanced 59 percent, boosted by the $301 million hotel portion of Detroit’s $1.0 billion mixed-use development and the $218 million hotel portion of the $400 million expansion of the Resorts World Hotel and Casino in South Ozone Park, N.Y. Warehouse construction in October grew 17 percent, helped by groundbreaking for a $225 million fulfillment center in Rialto, Calif., and a $125 million Dollar Tree distribution center in Marengo, Ohio. There were two commercial structure types that registered declines in October – commercial garages, down 5 percent; and store construction, down 16 percent. The institutional side of nonresidential building increased 28 percent in October. Transportation terminal construction starts jumped 92 percent, with the boost coming from the start of the $1.4 billion Terminal One building at Newark Liberty International Airport and the $655 million concourse expansion project at Denver International Airport. The October entry for the concourse expansion project follows another $700 million concourse expansion project at Denver International Airport entered as a September construction start, as well as that airport’s $650 million main terminal upgrade project that was entered as a July construction start. The amusement and recreational category in October climbed 89 percent, reflecting groundbreaking for the $860 million expansion of the Las Vegas Convention Center in Las Vegas, the $182 million convention center and casino portion of the Resorts World Hotel and Casino expansion in South Ozone Park, N.Y., and the $177 million convention center portion of Detroit’s $1.0 billion mixed-use development. The healthcare facilities category had a strong October, rising 60 percent with the support of six projects valued at $100 million or more, including a $282 million outpatient facility in Richmond, Va., and a $242 million hospital in Wexford, Pa. Also showing growth in October was the public buildings category, up 95 percent from a weak September, helped by the start of a $140 million courthouse addition in Charlotte, N.C.
Educational facilities, the largest institutional category, ran counter to most of the other institutional structure types with an 18 percent decline in October. The largest educational facility projects entered as October construction starts were an $85 million renovation to a research laboratory in Boston, a $77 million high school in Cottonwood Heights, Utah, and a $71 million high school in Seaside, Ore. The religious building category also weakened in October, dropping 18 percent. The public works categories as a group rose 6 percent in October, with a varied performance by individual category. Highway and bridge construction starts climbed 26 percent, with October coming in as the highest seasonally adjusted monthly amount so far in 2018. Large highway and bridge projects in October were led by the $1.3 billion U.S. portion of the Gordie Howe International Bridge (estimated at $2.6 billion in U.S. dollars for the entire bridge), connecting Detroit and Windsor Ontario. Other large highway and bridge projects in October were the $802 million I-395 project in Miami and the $673 million I-10 Corridor project in San Bernardino, Calif. The top five states ranked by the dollar amount of highway and bridge construction starts in October were Texas, Michigan, Florida, California, and Pennsylvania. The miscellaneous public works category pulled back 33 percent in October from its heightened September pace, which included the $1.4 billion Arbuckle II natural gas pipeline in Texas and Oklahoma, as well as the $1.1 billion Cactus II oil pipeline in Texas. The October data did include the start of one major pipeline project – the $2.0 billion Gray Oak oil pipeline that will transport crude oil from the Permian Basin to the Corpus Christi, Texas area. Residential building in October was $321.7 billion (annual rate), rising 2 percent. The lift came from multifamily housing, which increased 15 percent in October. There were 13 multifamily projects valued at $100 million or more that were reported as October starts, compared to six such projects in September. The large multifamily projects in October included the $580 million multifamily portion of the Winthrop Square Tower in Boston, the $535 million Veyoel Moshe Gardens residential development in the Poughkeepsie, N.Y. area, the $300 million Laurel multifamily complex in Philadelphia, and the $184 million multifamily portion of Detroit’s $1.0 billion mixed-use development. Through the first 10 months of 2018, the top five metropolitan areas ranked by the dollar amount of multifamily starts (with their percent change from a year ago) were New York (up 3 percent), Boston (up 91 percent), Miami (up 44 percent), Washington, D.C. (up 20 percent), and Seattle (up 25 percent). Metropolitan areas ranked six through 10 were San Francisco (up 11 percent), Los Angeles (down 31 percent), Dallas-Ft. Worth (up 24 percent), Atlanta (down 15 percent), and Chicago (down 43 percent). Single family housing in October decreased 4 percent, as affordability constraints continue to make it difficult for this project type to register any sustained upward movement during 2018. By geography, October showed single family declines in four of the five major regions – the Northeast, down 10 percent; the South Central, down 8 percent; the West, down 6 percent; and the Midwest, down 5 percent. Only the South Atlantic, growing 4 percent, was able to post a single family gain in October. The 1 percent increase for total construction starts on an unadjusted basis during the first 10 months of 2018 was due to mixed behavior by the three major construction sectors. Residential building maintained its 6 percent lead over last year, with the dollar amount for both single family housing and multifamily housing up 6 percent. Nonresidential building year-to-date slipped 2 percent, with institutional building down 8 percent, commercial building down 3 percent, and manufacturing building up 32 percent. Nonbuilding construction year-to-date dropped 4 percent, as a 5 percent increase for public works was outweighed by the 45 percent plunge for electric utilities/gas plants. By major region, total construction starts during the January-October period of 2018 showed this pattern compared to a year ago: the South Central, up 11 percent; the Midwest and South Atlantic, each up 5 percent; the West, down 1 percent; and the Northeast, down 18 percent. The year-to-date decline in the Northeast was relative to the robust first 10 months of 2017 that included such construction starts as the $7.6 billion LaGuardia Airport project in Queens, N.Y., a $5.8 billion ethane cracker facility in Monaca. Pa., the $1.7 billion 50 Hudson Yards office tower in New York, the $1.6 billion Moynihan Station rail terminal project in New York, and the $1.4 billion Penn Medicine Patient Pavilion in Philadelphia.